Use the Broker Commission Sales Agreement when providing sales, advertising and marketing services on commission. This agreement covers compensation, engagement of services, ownership rights, non-compete, confidentiality and other standard clauses. Contract Pack for a couple years now and have found it invaluable. Would highly recommend it to anyone in the field. A real time saver." This Broker Commission Sales Agreement is included in editable Word format that can be customized in Word or by using the included Wizard software. How do you write a Broker Commission Sales Agreement document? THIS AGREEMENT is made this Current Day day of Current Month, Current Year by and between Company Name ("Company") and Company Name ("Broker"). Broker desires to provide sales and marketing services on behalf of Company Name for a commission. Company desires to have Broker render certain sales, marketing and advertising services (the "Services") as set forth in Exhibit B. In consideration of the mutual covenants set forth in this Agreement, Company and Broker hereby agree as follows. Broker shall adhere to all Company policies concerning the listing, marketing, selling, fulfillment and documentation of all sales of Company's products and services. Broker shall be eligible to participate in Company-sponsored sales strategies and creative marketing programs, including sales programs and incentives. Company reserves the right to modify the commission structure or assign associated costs in exchange for broker's voluntary participation in present or future Company marketing or affinity programs. All commissions are to be paid to broker alone on Settlement Date for commissions owed Settlement Closing Date. Company reserves the right to deduct any monies owed for unpaid balances due the company or any other unpaid monies owed by Broker to Company. All unpaid balances owed Company shall be subject to late fees and/or interest if not paid within 30 days of notification. All commissions shall be paid to broker according to Exhibit A and no modification of this rate sheet or schedule shall be valid without the express written permission of the Company. All expenses or cost sharing must be approved in writing by the Company in advance of incurring the expense(s). All agreed upon expenses and cost sharing shall be deducted from Broker's commission at the date the expense is paid by Company or at the closing date of a commission cycle. Commissions may only be shared with another authorized Broker or authorized Company representative and must be approved by the Company prior to settlement date. Broker may not enter into any co-listing, co-marketing, partnership or other arrangement concerning the sale or commissions paid by Company to Broker without prior written approval. Commissions will only be paid on monies received by Company. Company reserves the right to modify or deduct all collections or legal expenses incurred from commissions for monies not collected from Broker's customers. Broker shall not be entitled to any draws against commission, salary, bonuses or any other compensation not set forth in Exhibit A. Broker is responsible for maintaining all licenses, fees, expenses or other related business obligations Broker incurs and Company shall not be responsible for any expense or obligation incurred by Broker in the execution of this Agreement or the rendering of the Services. Services and Service Requirement. Broker agrees to develop and perform the sales, advertising and consulting services pursuant to the specifications set forth in Exhibit B attached hereto (the "Services"). Broker shall earn a commission for all sales completed according to the Services and according to the commission and compensation schedule set forth in Exhibit A. For the purpose of this Agreement, Commission shall mean the net commission after fees and deductions are applied. Deductions may include but are not limited to: agreed upon marketing and advertising costs, unpaid balances owed to Company from Broker, taxes, fees, transaction fees, credit card fees, NSF fees, courier fees, reductions due to error or omissions, or fees for any incentive program that the Broker voluntarily participates in. All settlement closing dates determine when commissions and deductions shall be applied. Company shall not be responsible for commissions and compensation earned by Broker for sales that are later canceled, returned, revoked, made invalid, result in a chargeback or are otherwise not credited to the Broker for any reason. Company reserves the right to deduct commissions and fees paid to Broker from future commissions in order to bring incorrect commissions paid to Broker into balance. Monies received by Company that qualify for a commission occurring after the Broker or Company has terminated this Agreement shall be subject to qualification here. Broker shall endeavor to ensure that Company shall be able to retain, under the fullest extent under the law, all customer lists, contracts, records and all intellectual property rights in any text, images or other components created for Company pursuant to this Agreement. Broker agrees that any material, content, plan or idea prepared by Broker or submitted to Company for approval at any stage which is not utilized at the termination of this Agreement shall remain the property of Company. Upon termination or expiration of this Agreement, Broker agrees to be solely responsible for returning any Company materials, process documents, customer lists, contract lists, internal documents or advertisements. Broker may not copy or remove these company materials for any reason not related to the performance of his or her duties under this Agreement. Broker agrees not to provide any services or consulting for, or enter into any agreement with any company or individual engaged in a similar line of business, whether they compete directly or indirectly with Company for a period of Insert number of years years after the expiration of this Agreement. Broker warrants that he or she is not currently subject to any agreement which limits, prevents or precludes his or her ability to render all of the services listed in Exhibit B. Further, Broker may not directly or indirectly solicit or influence any Company employee, agent, vendor or representative for the purpose of leaving the employment or existing relationship established with Company Name. Broker acknowledges and agrees that the Services and all other documents and information related to the engagement of sales, marketing or advertisement development (the "Confidential Information") will constitute valuable trade secrets of Company. Broker shall keep the Confidential Information in confidence and shall not, at any time during or after the term of this Agreement, without Company's prior written consent, disclose or otherwise make available to anyone, either directly or indirectly, all or any part of the Confidential Information. Excluded from the "Confidential Information" definition is anything that can be seen by the public in any advertising medium or channel (displayed or placed) prior to the engagement of Broker to provide services, or information which was provided to Broker by Company for publication as a requirement of fulfillment of the Services. Limited Warranty and Limitation on Damages. Broker agrees to indemnify and hold Company harmless with respect to any claims, loss, lawsuit, liability or judgment suffered by Company that results from the use of any quote, estimate, proposal or material prepared or execution of service by Broker or at the direction of Broker which has been materially changed from the Services by any advertisers, publishers, hosts, radio and television broadcasts, quotes, testimonials, print journalism or other third-party entity. Broker agrees to obtain and/or maintain in force for the length of this Agreement, at Broker's expense, an appropriate liability policy or policies, having a minimum limit of Insurance Coverage, naming Company as an additional insured and loss payee under such policy or policies as applicable. In the event of any litigation, proceeding, or suit against Company or in the event of a court action challenging any quote, estimate, proposal, promise or advertising or marketing service prepared by Broker, Broker shall assist in the preparation of defense of such action and cooperate with Company. Company acknowledges that Broker is not responsible for the results obtained by Company from any sale, estimate, proposal, quote, creative, advertising, programs, ideas or execution thereof. Broker waives any claim for damages, direct or indirect, and agrees that his or her sole and exclusive remedy for damages (either in contract or tort) is the return of the consideration paid to Broker as set forth in Exhibit A attached hereto. Broker will be retained as independent contractor. Broker will be fully responsible for payment of his or her own income taxes on all compensation earned under this agreement. Company will not withhold or pay any income tax, social security tax, or any other payroll taxes on Broker's behalf. Broker understands that he or she will not be entitled to any fringe benefits that Company provides for its employees generally or to any statutory employment benefits, including, without limitation, worker's compensation or unemployment insurance. Company agrees to make available to Broker, for Broker's use in performing the services required by this Agreement, all sales material, sales kits, logos, graphics, photos, branding, collateral, and items of hardware and software as Company and Broker may agree are reasonably necessary for such purpose. This Agreement shall be governed by and construed in accordance with the laws of the State. Exclusive jurisdiction and venue shall be in the County County, State Superior Court. This Agreement shall be binding upon and inure to the benefit of Company and Broker and their respective successors and assigns, provided that Broker may not assign any of his or her obligations under this Agreement without Company's prior written consent. Each party represents and warrants to the other that such party has acted in good faith, and agrees to continue to so act in the negotiation, execution, delivery, performance, and any termination of this Agreement. In the event Company fails to make any of the payments set forth on Exhibit A within the time prescribed in Exhibit A, Broker has the right to withhold further sales activity and consulting, creative content and services performed for or on behalf of Company until payment in full is made, plus accrued late charges of 1 1/2% per month. Broker agrees to indemnify and hold Company harmless from any and all claims brought by any third party relating to any aspect of the quotes, estimates, promises, warranties, proposals, services, creative or other content, including, but without limitation, any and all demands, liabilities, losses, costs and claims including attorney's fees arising out of injury caused by Broker's activity or non-delivery of products/services, material supplied by Company, copyright infringement, and defective products sold via the advertising or services. Further, Company agrees to indemnify Broker from responsibility for problems/disruptions caused by third-party services and contractors that Company may use, such as fulfillment resources, media buyers, transportation, merchant accounts, shopping carts, shipping, hosting services, real-time credit card processing and other services that relate to the execution by Broker of the services outlined in this Agreement. Company grants Broker the right to use the creative content, description of services performed, results of services and campaign data as he or she sees fit for promotional purposes. Broker has no responsibility for any third-party theft of all or any part of the content, ideas, or services provided to Company by Broker that is not the result of Broker's negligence. This agreement shall begin on Start Date and shall continue in full force until terminated by either party upon at least thirty (30) days prior written notice. Both parties represent and warrant that, on the date first written above, they are authorized to enter into this Agreement in its entirety and duly bind their respective principals by their signatures below. 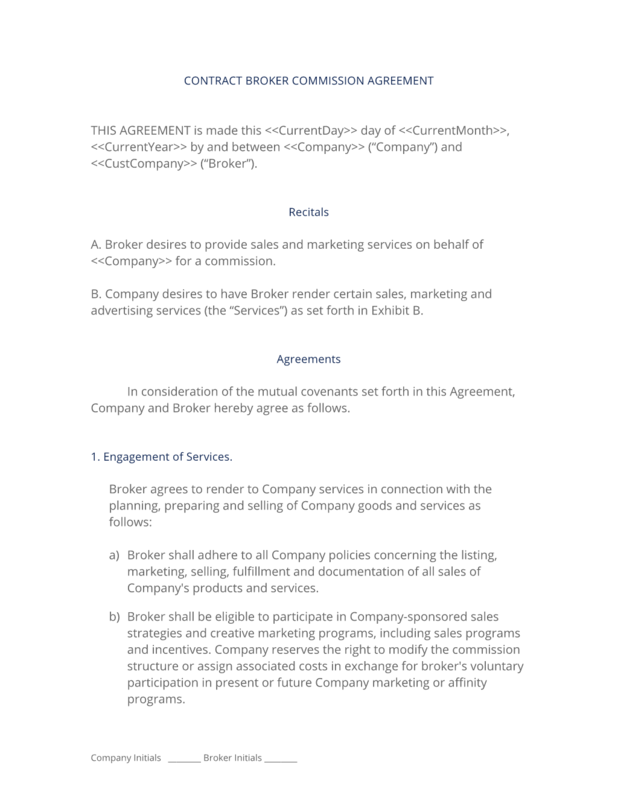 The complete Broker Commission Sales Agreement - with the actual formatting and layout - is available in this Contract Pack.